Small satellite galaxies and star clusters orbiting the Milky Way are often torn apart by its gravitational potential, leaving behind trails of stars stretched out across the sky (Figure 1). These stellar streams (more info in this astrobite!) contain information about the history of their parent object and can be studied to learn about the evolution of the Milky Way in an approach referred to as “Galactic Archaeology.” Like archaeologists who study ancient history on Earth, Galactic archaeologists search for present-day remnants of historical events. The spatial structure and the properties of the stars that make up these stellar streams tell a story of the parent object’s evolution and eventual destruction. To study the star formation history of a stellar stream, scientists compare data to theoretical models of stellar populations. Stellar evolution is one area of astrophysics that is fairly well understood, so detailed predictions can be made about how stars evolve throughout their lifetime. In particular, stars that form at the same time in the same environment will have the same composition and the same age, but will also have a wide range of masses that will trace out a distinctive curve through stellar brightness and color referred to as an isochrone (meaning equal age). (Figure 2 illustrates several isochrones as a stellar population evolves.) Comparing these isochrones to the observed groups of stars can determine how long ago these stars formed and their approximate composition, and can therefore tell us about how the population of stars and the environment in which they form changes throughout history. 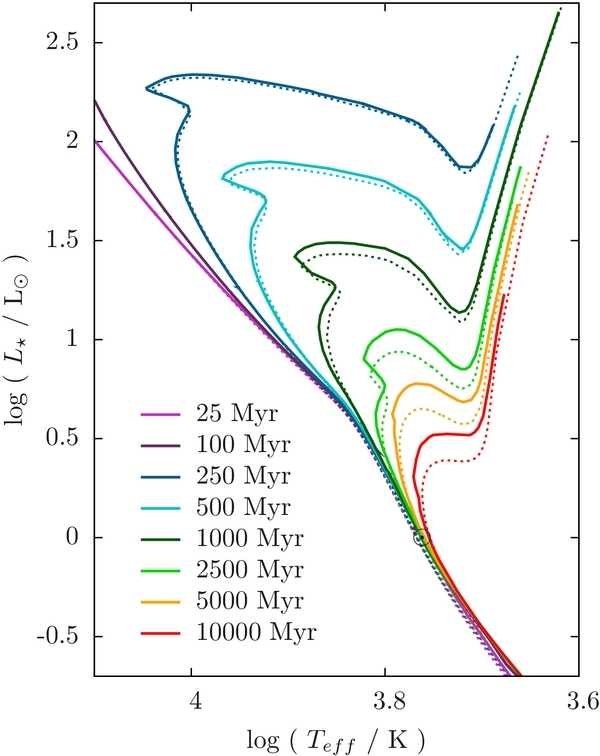 In today’s paper, de Boer and collaborators study the star formation history of different regions of the Sagittarius stream. This stream is the largest and brightest known stream in the Milky Way system, and is the remnant of the Sagittarius dwarf galaxy, one of the largest satellite galaxies orbiting the Milky Way. Image Credit: R. Ibata (UBC), R. Wyse (JHU), R. Sword (IoA). http://annesastronomynews.com/annes-picture-of-the-day-the-sagittarius-dwarf-elliptical-galaxy/. The authors are especially interested in a region where the stream is split into two – a brighter half and a fainter half. Do these two regions come from the same place? Did they form stars at the same time and in the same environment? And if they are in fact both remnants of the Sagittarius dwarf galaxy, what causes their difference in appearance? Figure 3. The star formation history of the Sagittarius Stream. The y-axis is the composition, and the x-axis is the age of the observed stars. The color indicates the star formation rate – red regions were times of rapid star formation and blue regions were slower. In the bright region (left), two times of rapid star formation are visible – at an age of about 7 billion years and an age of about 12 billion years. Star formation cuts off around 5 billion years. In the faint region (right), the overall star formation rate is much lower and stars stopped forming earlier. Source: Figures 5 and 9 in the paper. They discover that the stars from both the bright and faint regions follow a tight relation between age and composition, meaning that at any given time the stars being formed had a similar composition and formed in a homogeneous environment. They also find that this relationship is similar to that of stellar clusters known to belong to the Sagittarius dwarf, confirming that both the bright and faint parts of the stream were stripped from the galaxy. The ages of stars in the two parts of the stream span about 8 billion years and then have a cut-off that indicates that star formation in the Sagittarius dwarf stopped about 5 billion years ago. This sudden halt of star formation was probably caused by the Sagittarius dwarf being torn apart! Even though star formation in the Sagittarius dwarf appears to have ended only 5 billion years ago, the fainter part of the stream has very few stars formed less than 10 billion years ago. These stars also have a simpler composition. This means that this part of the stream comes from a region of the dwarf galaxy in which star formation stopped earlier before more complex stellar populations were able to develop. This could mean it was stripped earlier than the bright part of the stream and only from the outskirts of the galaxy. 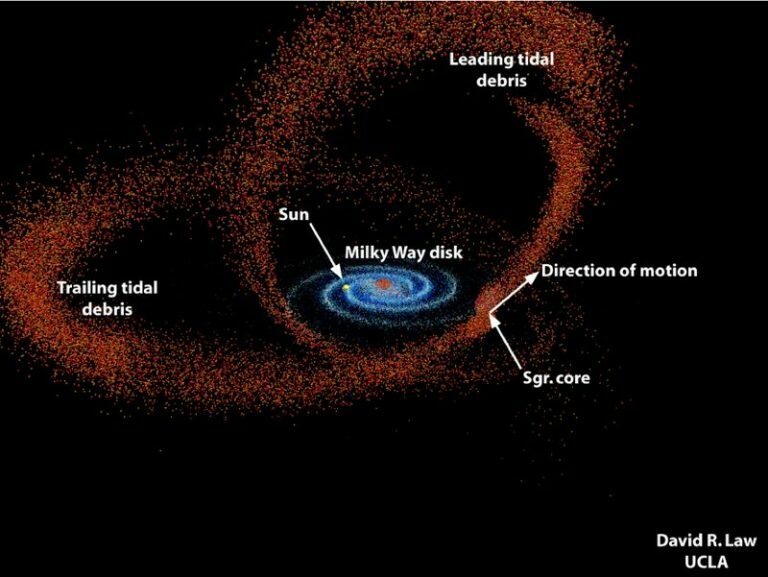 Observations of the stars in the Sagittarius stream were therefore able to provide clues to the history of star formation and the destruction of the Sagittarius dwarf galaxy. 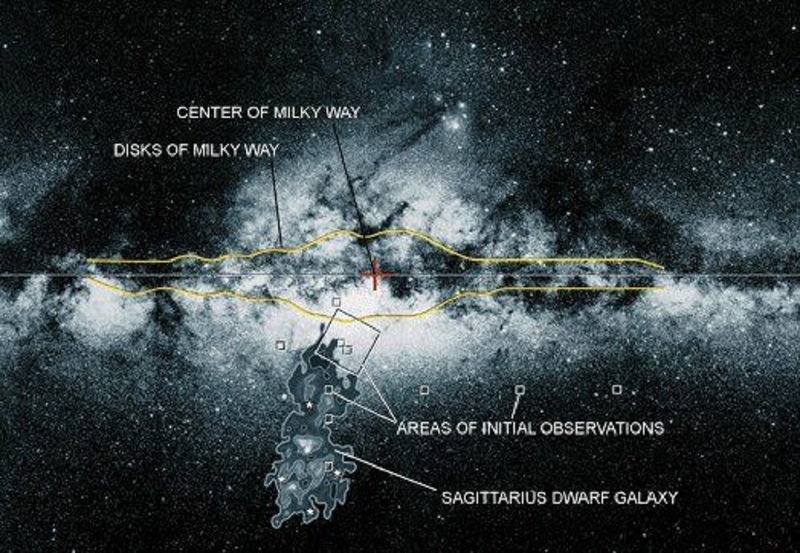 They revealed the origin of the Sagittarius stream, how many billions of years ago different parts of the stream were torn apart from their parent galaxy, and how the composition of these stars changed over the 8 billion year history of star formation in the Sagittarius dwarf galaxy. All of this is only the beginning of Galactic Archaeology, an exciting field that involves taking present-day artifacts of stellar systems and revealing secrets of their complex history spanning billions of years.